Catering At Your Door is so much more than great food. It is the beginning of a great celebration! Catering At Your Door is a Maryland based catering & event planning company that brings vast collection of menus, & catering services in Virginia, Maryland, and Washington D.C. areas including Baltimore, Rockville, Chevy Chase, Potomac, Silver Spring, Darnestown, Vienna, Falls Church, Chantilly, Reston, Gaithersburg, Alexandria, Fairfax, and Manassas. Our brunch menus have been prepared by experienced chefs to suit local as well as international tastes. Want to make your event extra special? We will provide Crepe Stations, Pasta Bars, Fajita Stations and Fresh Fruit Smoothie Bars within your catering budget! Make your wedding unforgettable with interactive presentations from our chefs. Call (240) 328-5071 to discuss your event with local caterers of Maryland. Catering At Your Door provides professional and knowledgeable staff for private as well as corporate events. Our team will take care of every detail associated with your celebration and make your guests feel valued as well. Whether you are planning a fundraiser, wedding or family reunion, Catering At Your Door will help you plan that special event within your budget. Catering At Your Door uses eco-friendly products and business practices at every opportunity to protect nature. We believe in minimizing wastage and maximizing satisfaction. For over 20 years David and Jennifer Model have been known for their reputation as well as their unsurpassed dedication to providing the highest quality catered events. 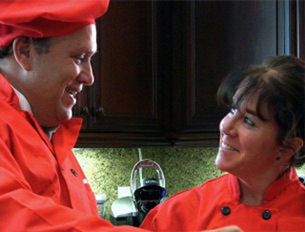 David and Jennifer met at the University of Maryland while studying food, nutrition and marketing. With a love of food, they hatched their plan when they were sophomores to make this their full time career.